Columbia Sportswear settled a trade-secrets lawsuit against Crocs. 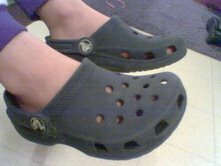 The suit stemmed from Crocs’s hiring a Columbia employee as an independent contractor. Columbia alleged claims of misappropriation of trade secrets, intentional interference with contract, and aiding and abetting the employee’s breach of his duty of loyalty to Columbia. Read a report from the Denver Post here.